This set was typical of the larger table models that were being produced by B&O in the early 1950s. Its large and richly veneered cabinet housed a sturdily built 4 valve chassis that covered all the AM bands that were then in use for entertainment programmes. An extra key automatically selected the Danish programme without the need to adjust the tuning. Text copyright © Beocentral. Unauthorised reproduction prohibited. Because of the diversity of mains supplies in use in Denmark at the time the power supply section had to be made particularly versatile. The set could run on 220V or 110V AC or DC, selection being made by a reversible plug on the chassis. The cabinet contained two quality loudspeakers of B&O’s own manufacture, a large “kino 120” unit, complete with a moulded Bakelite basket, for the bass and a high frequency driver matched into a wooden slot horn for the treble. These loudspeakers were driven through a two element crossover network and were complemented by elaborate tone controls in the pre-amplifier which made use of sophisticated negative feedback circuits. Text copyright © Beocentral. Unauthorised reproduction prohibited. Unusually for a 1952 set, a connection for a Beocord tape recorder was provided. This needed a special isolation transformer to be plugged in inside before it could be used. A connection for a record player was also fitted and different types of pickup could be accommodated by exchanging a small plug-in module on the chassis. Text copyright © Beocentral. Unauthorised reproduction prohibited. 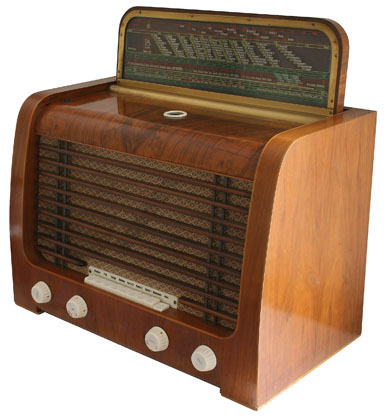 The receiver section featured a developed version of B&O’s “radio heart” coil pack, integrated with the waveband switches. A “magic eye” tuning indicator was also fitted, it was of the “dual sensitivity” type and was located beneath the flip-up glass tuning scale. The scale was printed with many station names from around the world and also included a specially prepared strip of paint on the outside onto which the owner could mark their own favourite choices. Text copyright © Beocentral. Unauthorised reproduction prohibited. Though only suitable for AM listening, the Master 507K did include an FM pushbutton, an FM scale on the dial (calibrated correctly with the frequencies that would be used once an FM service was established in Europe) and an FM aerial socket at the back. This was to allow the set to be “converted” to FM reception at some future date but it is uncertain as to whether this was ever possible. The changes that would have to have been made inside would have been considerable and possibly costlier than another set. Text copyright © Beocentral. Unauthorised reproduction prohibited.